This coming Friday 1st of February, there's gonna be a sick Sk8 Art Show of the Montreal scene at Green Light Gallery. 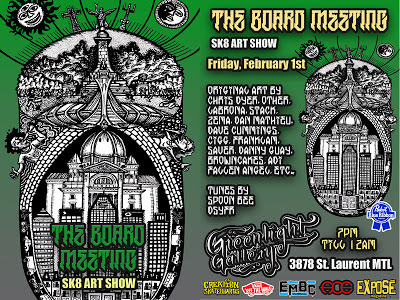 I will have a couple of new originals in there and helped curate this and made eth flyer too. Unfortunately I will be gone to Belgium by then, so wont be there personally, but don't let that desuade you from enjoying some great work by epic creators!! For details on this, go HERE. 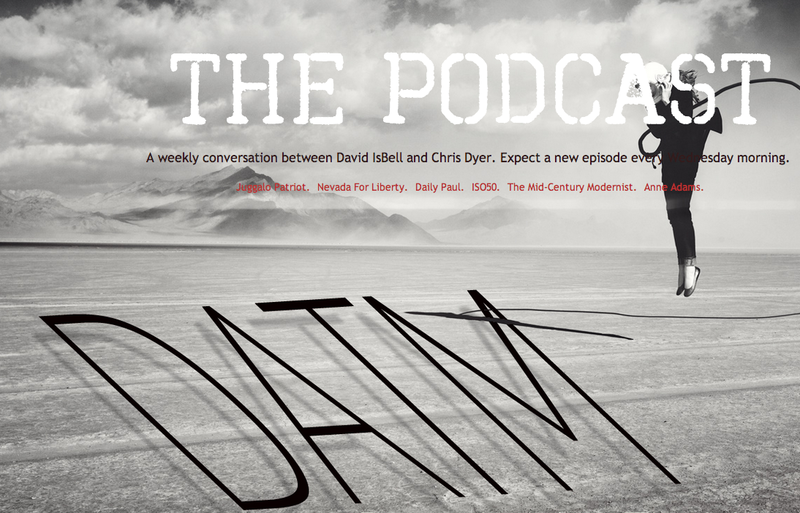 Last night I had a short interview in a Pod Cast show from Las Vegas called "Dave against the Machine". I was sorta caught off off guard, but over all I think it was a fun talk. Funny thing is the interviewer is also called Chris Dyer. Anyways, my section starts at minute 42:22 of Episode 77. You can listen to it HERE. This week a profile of me and my art poped up on Wikipedia, the biggest online encyclopedia matrix ever. I now am officially real to the mainstream world of information. Check it out HERE. 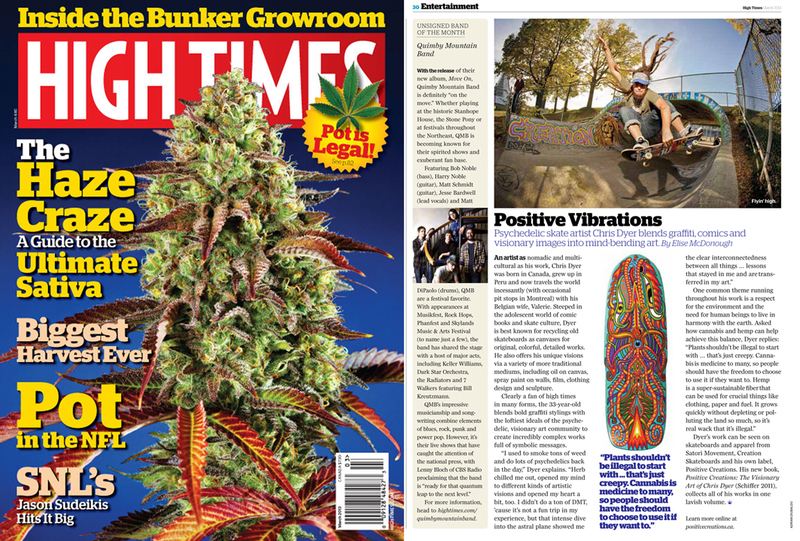 To start the year on a good foot, the very popular and widely distributed magazine HIgh Times has a nice article on me this new issue. Stoked to reach out to that scene, even if I dont smoke weed anymore. Go and get your copy yo! Last week I joined this Grant Contest called "See Me". If I win I get grants to continue my art career growing. I hate to ask you stuff and put you to work. But if you don't mind going over tehre and pressing the "Support" button, Id be stoked. Link is HERE> Thanks!! 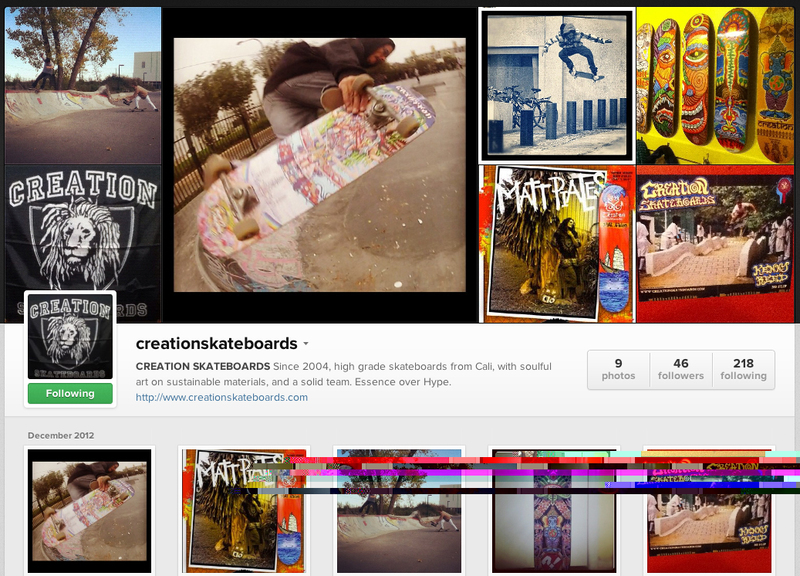 Creation Skateboards, the California based brand I manage and art direct is now on Instagram. If you play that popular video game, please go and follow their fun posts> They can be followed HERE. And if you wanna follow me on there too you can link up HERE. Happy new Year 2013!! 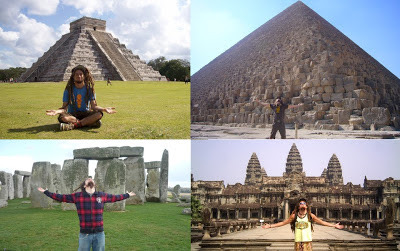 The infamous winter solstice came and ent and we didnt have neither a hollywood apocalypse nor a new age ascension I was hoping for some degree of change to put humanity on a better direction, but just stoked to continue the blessings of my own reality, with its own ups and downs. Anyways, lets hope that the shift is actually in process, subtle and gentle and that we are in transition to the promised Golden age. I've been chilling out on my blog posts, but Im back here in action for ya. Hopefully Im not talking to myself! !